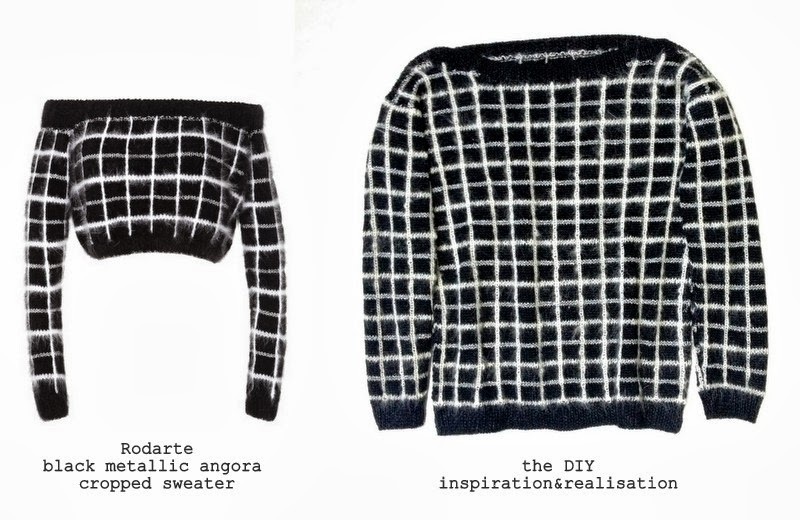 I'm in love with the grid pattern and loved even more the extra sparkle of the Rodarte SS 2014 version, but I'm not a big fan of cropped sweaters in general, and since I made this now with the intention of wearing it all winter, I wanted it to be as warm as possible. So here is my adaptation: not off the shoulders, but a boat neck neckline, and not cropped, but a simple design that sits just below the the hips. 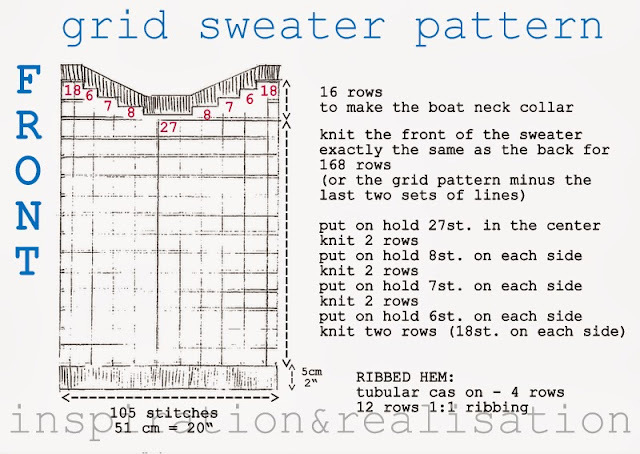 The making of this sweater is really easy. The stitches involved are just knit and purl, and there aren't really any difficult steps since the construction is a basic rectangle and trapeze for the sleeves. To make this grid sweater, actually you knit the whole sweater with just stripes. ... keep following the step-by-step tutorial and see how is done! 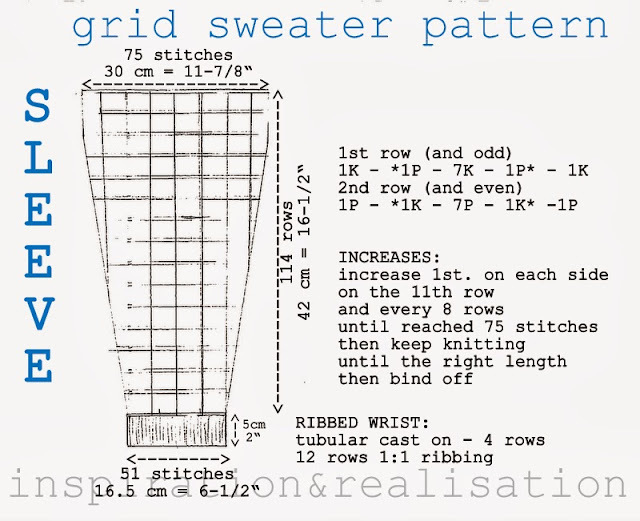 see the pattern below with all the detailed measurements and stitches. Once the ribbed part for the boat neck is done, don't bind off, leave it on the needle. 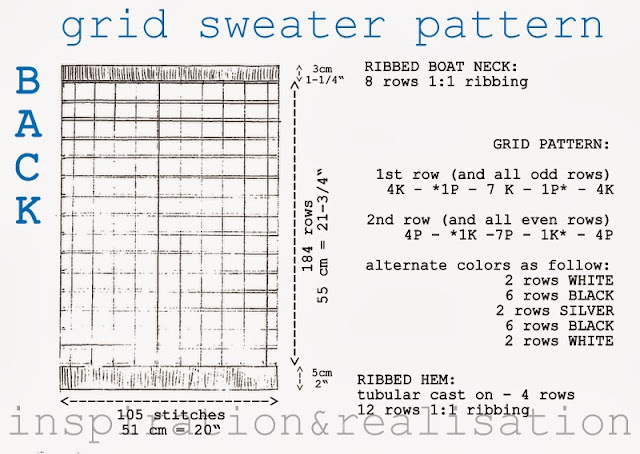 once all the stitches needed for the neckline are on hold, knit up until the end of the grid design. pick up all the stitches on hold, and using a crochet hook, pick up evenly few extra stitches on the sides (I ended up with 119 stitches total) and work the1:1 ribs for 8 rows. then put on hold the 83 stitches in the middle. 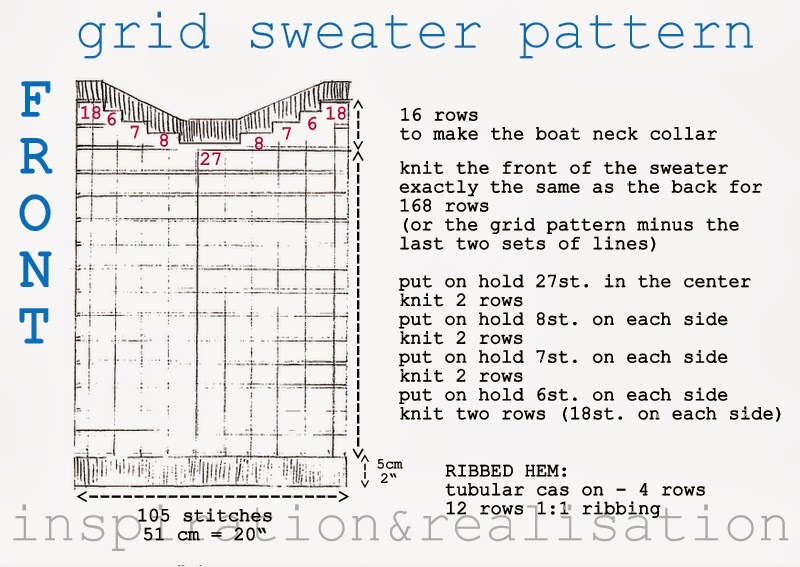 Using the three needles method, join front and back for 18 stitches on each side. At this point, this is what your parts will look like. now it's time to make the GRID happen! I pinned the picture for the "easy knitted plaid" from yarn.com long time ago and I knew I wanted to make something in black and white. Since both the picture and the video below are so clear and well done, I'll leave it to them to explain how to go from stripes to grid (or "faux plaid")! The only difference between the tutorials from yarn.com is that I looked closely at the Rodarte stitching and the stripes in contrasting colors are always done in two rows - this way the black yarn doesn't need to be cut at every stripe and it's less weaved ends at the end. At this point, it's almost all done. Except... weaving in all the ends will take a big while. Then sew the sleeves and the sides and give your new sweater a nice hot pass under your steamy iron and it's ready to wear! thank you, Erin <3 !! So.... I want one. AHHH!!! get to work, girl :) !! Bellissimo! La griglia mi piace tantissimo e anche l'assenza dello scollo per la manica che rende tutto più veloce! Come va con la macchina per la maglia? I can't believe you did that completely from scratch.